Coke Studio is not a music platform now, instead, it has become a brand. Every year, coke studio invents something new and unique. This time the coke studio is going to be more amazing and thriller as never before. One of the best thing of this season that has been revealed is the Coke Studio Explorer. This is basically an exploration of the hidden talent of the country. 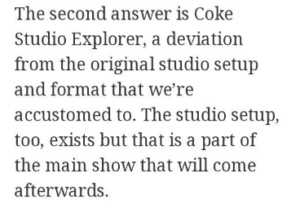 What is Coke Studio Explorer? The new producers of coke studio named Ali Hamza and Zohaib Kazmi traveled across the whole country with the slogan of Coke Studio Explorer. Through this campaign, they tried to bring the hidden talent of the country on Pakistan’s famous music platform named coke studio. The music stories of these talented people will be aired on the screen soon. Although this season is comprising in two sections one in the natural scenery with the hidden talent. While other on the coke studio platform like previous years. Coke Studio has already revealed it a few time ago, but actual advertisement and an introduction of the people make it crazier. You will be able to see the new faces and talented people this season. Half section of the coke studio 2018 season is shot in different regions of Pakistan. Rest of the section will be covered in coke studio as usual. Hence this season going to be more exciting and crazy. What’s New in this Season? You will see some glimpse of simplicity and talent. People from undeveloped regions with developed skills. Some cultural touch of beautiful and brilliant girls. Moreover, some Traditional folk dances along with cultural songs and music. Furthermore, some people who showcase their skills in old age without any deficiency. More motivated and devoted producers who are in search of great talent. Struggling hard for the betterment of Pakistani music industry. The view of the elegant and astonishing scenery of the beautiful regions of Pakistan. As expected, people love to see this amazing chemistry of natural scenery along with new faces. People show positive response and send love words. People are anxiously waiting for this season, hence it had already stolen the show.